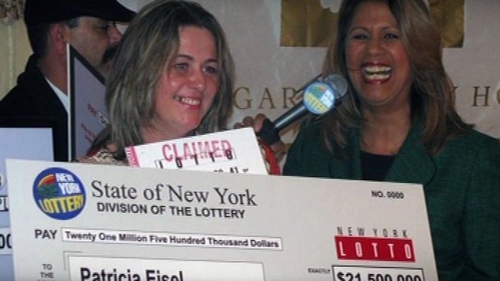 An Irish-born woman who won a $21.5m jackpot in the New York State Lottery claimed her prize at a news conference on Long Island last night. Patricia Daily Eisel, 40, is a mother of three who lives in Long Beach, Long Island. She works as a waitress and matched all six numbers to win the prize in the draw on 5 January. 'When I checked my numbers I just started shaking,' she said. 'I was doing my laundry at the time and decided to check the results from the night before. Ms Daily Eisel moved to the US in 1995 and has returned home to Tullamore, Co Offaly, to spend this evening with her family. She missed a trip home at Christmas because of a snow storm. Ms Daily Eisel told RTÉ News the win had come at 'the right time for all the right reasons'. The mother of three has appealed for privacy and is celebrating her win with family. She said that she was supposed to be in Ireland when she bought the winning ticket.